The M S Swaminathan committee’s widely disseminated recommendation, to fix MSP at levels “at least 50 per cent more than the weighted average cost of production”, remains a holy grail or partial reality at best. It is a formula on the lips of every farmer-protester today. But the M S Swaminathan committee’s widely disseminated recommendation, to fix minimum support prices (MSP) for crops at levels “at least 50 per cent more than the weighted average cost of production”, remains a holy grail or partial reality at best. The National Commission on Farmers — as the panel headed by the agricultural scientist was called — did not elaborate on what really constituted “weighted average cost of production” in its report submitted in October 2006. The Commission for Agricultural Costs and Prices (CACP), on the other hand, gives three definitions of production costs: A2, A2+FL and C2. A2 costs basically cover all paid-out expenses, both in cash and in kind, incurred by farmers on seeds, fertilisers, chemicals, hired labour, fuel, irrigation, etc. A2+FL cover actual paid-out costs plus an imputed value of unpaid family labour. C2 costs are more comprehensive, accounting for the rentals and interest forgone on owned land and fixed capital assets respectively, on top of A2+FL. The accompanying table gives all-India weighted average A2, A2+FL and C2 production costs for 14 crops, as projected by the CACP for the current 2017-18 kharif season. It also has the corresponding MSPs (inclusive of bonus) for these crops declared by the Narendra Modi government. The announced MSPs, it turns out, are Swaminathan formula-compliant — i.e. providing more than 50 per cent return — with respect to A2 costs for all the 14 crops, barring jowar (sorghum), ragi and sunflower. 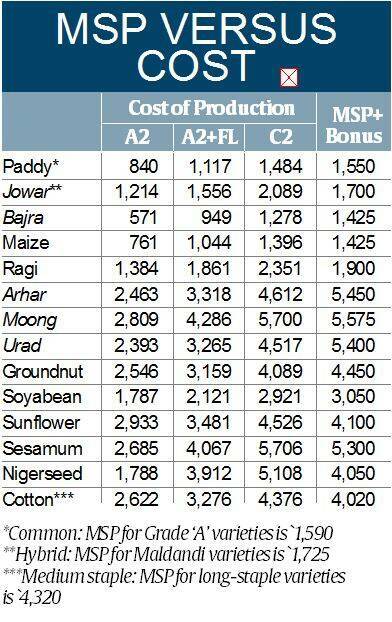 The average paid-out A2 costs for paddy, for instance, is estimated at Rs 840 per quintal. The MSP of Rs 1,550, then, works out 84.5 per cent more than this cost. However, for jowar, this year’s MSP of Rs 1,700 per quintal is just 40 per cent above the A2 cost. Moreover, when it comes to A2+FL, the Swaminathan formula of 50 per cent return over cost is satisfied only in three crops: bajra (pearl-millet), arhar (pigeon-pea) and urad (black gram). It’s even worse with regard to C2, where the 50 per cent profit recommendation is not met for a single crop. In the case of jowar, ragi, moong (green gram), sunflower, sesamum, nigerseed and cotton, the MSPs don’t even cover — leave alone provide a return over — C2 costs.